Ontario, CA, Nov 23, 2017 -- "The Messiah Returns" to Ontario in 2017! This is a "not to be missed" event! 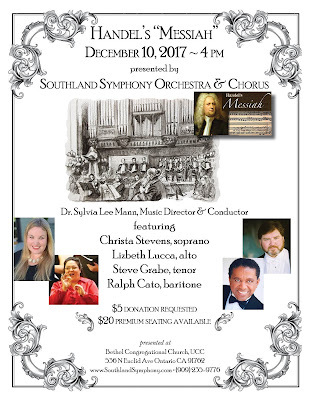 Who: The Southland Symphony Orchestra and Chorus present "Messiah", by George Friedrich Handel, with World-class soloists, full orchestra and chorus, under the direction of Dr. Sylvia Lee Mann. “Messiah”, the exquisite oratorio by George Fredrich Handel, was presented as an annual event at Bethel Congregational Church by S. Earle Blakeslee and the Foothill Oratorio Society, from 1945 - 1959, at which time the event had become so popular it was moved the Gardiner Spring Auditorium. The last performance was in 1970. So finally - after 47 years, the Southland Symphony Orchestra and Chorus bring Messiah home to Bethel. Featuring phenomenal soloists including Ralph Cato, Bass; Steve Grabe, Tenor; LizBeth Lucca, Alto; and Christa Stevens, Soprano. A newspaper article from approximately 1970 about the Messiah tradition was recently rediscovered. (It was found in the “History Room” at Bethel). The article features Mr. & Mrs. Blakeslee, and reads as follows: “For 25 Decembers, from 1945 to 1970, S. Earle Blakeslee lead the Foothill Oratorio Society Orchestra and Chorus in their rendition of Handel’s celebrated “Messiah”. First performed at Bethel Congregational Church, the performances were moved to Gardiner Spring Auditorium in 1959 to accommodate growing performances. The Southland Symphony presented its first concert in Ontario on Sunday, December 11, 2011. The orchestra's founder and director, Dr. Sylvia Lee Mann, who had recently relocated to the area, saw a need and an opportunity to bring symphonic music to the larger Ontario Community, a community which was already embracing arts and culture. Since that first concert, we have presented more than 30 free, full-orchestra concerts for this community. We have presented internationally renowned musicians from all over the globe, performing music of the greatest composers of history, and music of great composers still living today. Our Symphony Chorus is highly regarded, and has been invited to participate in a special Presidents Day 2018 "Mozart Requiem" performance at Carnegie Hall in New York City. Dr. Mann says of the orchestra, " Our purpose is to enrich our community by engaging audiences and inspiring a love of music through exciting live symphony performances, innovative programming, and educational outreach." We offer opportunities for the community to experience the very best in music, "right in their own back-yards." No long drives to downtown Los Angeles, no expensive parking. Arts and music for our community, in our community. The Southland Symphony Orchestra is a community orchestra, providing fantastic opportunities for qualified musicians to experience and perform live music of the highest quality. We welcome musicians of all ages and from all walks of life: Students and senior citizens, professionals and amateurs: Hobbyist, Professional, Retired…. All are welcome.